There’s a certain magic that comes with seeing theater. The actors, director and stage crew rehearse for weeks to present a story that draws the audience in, making them believe that the characters, the setting and the drama are real, at least until the curtain closes. 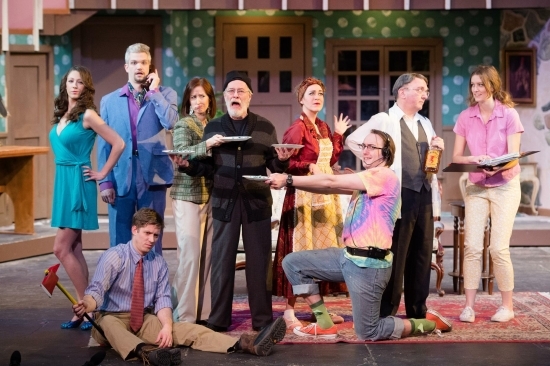 “Noises Off,” which opened Friday at Spokane Civic Theatre, cracks the lens of the rose-colored glasses worn by the enchanted theatergoer and gives the audience a glance, albeit a (hopefully) exaggerated one, at the truth behind how a play comes together. The Michael Frayn farce, directed by Bill Marlowe, follows a theater company working on a play called “Nothing On,” also a farce, from the final rehearsal to a performance near the end of the show’s run. And since Act I takes place during a “Nothing On” rehearsal, Jerry Sciarrio, playing director Lloyd Dallas, stood off stage, correcting Dotty Otley (Audrie Pursch) when she forgot to leave or take, at various times, a plate of sardines, a newspaper and a telephone. Sciarrio expertly plays the director, doing what he needs to, from soothing to shouting, to keep his cast and crew together in order to finish the show, and Pursch’s ability to juggle two accents – that of Otley and Otley’s “Nothing On” character Mrs. Clackett – is impressive. As each character is introduced in Act I, a new theater-type comes to life. There’s Garry Lejeune (perfectly played by Jack Fogarty), who is eloquent onstage, a bumbling mess off, and Brooke Ashton (Rushele Herrmann, a real trooper who spends most of the play in her underwear), the new actress who has her part down so well, she doesn’t adjust it like her fellow actors do when things start to fall apart. Then there’s Fredrick Fellowes, an actor who means well but is always either questioning his character’s motivation or apologizing for his performance or frequent nosebleeds (a fun performance from Kyle Ross), and Laticia Brannon perfectly balances Belinda Blair’s optimistic, supportive nature with her love of sharing cast gossip. Gary Pierce is wonderful as Selsdon Mowbray, an elderly actor with a hearing and drinking problem who is constantly being babysat by the rest of the cast, lest he run off for a drink. Mikyla Bordner and Samuel Peters are spot on as assistant stage manager Poppy Norton-Taylor and stage manager Tim Allgood, respectively. Bordner’s nervous Nellie portrayal of Norton-Taylor is just as fun to watch as Peters’ less anxious, though still flustered Allgood.